If you are looking for gold coins for sale you have many choices on where to purchase this type of gold bullion. There are online dealers as well as auctions, and each of these methods has pros and cons involved. Gold buyers from all over the world use both of these methods, and each carries risks and offers rewards. To understand the differences between these two ways of buying gold bullion coins for sale, and to decide which method is best in your specific case, you need to understand how each method works. With online gold dealers you want to make sure you buy exclusively from reputable sources to ensure the highest quality of service and products. Most well known dealers will have the current spot price of precious metals posted right on their home page to eliminate any confusion. Each coin or bar for sale will come with detailed descriptions, photos and pricing ranges depending on how many you are buying. Some really good online sellers offer live online support to answer buyers’ most burning questions. There will be a price set for the items you are interested in, and you either decide to purchase the item or pass on it. With online auctions the process is done differently. You will need to register as a bidder, and then you will be able to bid on all of the coins being offered as lots during the auction. Both methods offer a wide variety of gold coins for sale, including American Eagle gold coins and Krugerrand gold coins usually. If you are using an auction to find gold coins for sale then you should be careful to make sure you understand what the bidding price is, stick to your budget, and know what you are bidding on. 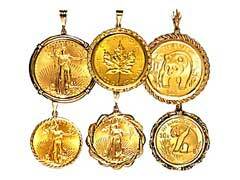 You can find Maple Leaf gold coins as well as numerous other types. Both methods of gold bullion purchase can be limited, because you may be looking for a rare or popular coin that is not offered at the auction or in stock right now. Either way of buying gold coins for sale may be the right choice for your gold investing needs, as long as you learn the process and understand some of the common mistakes that can be made.